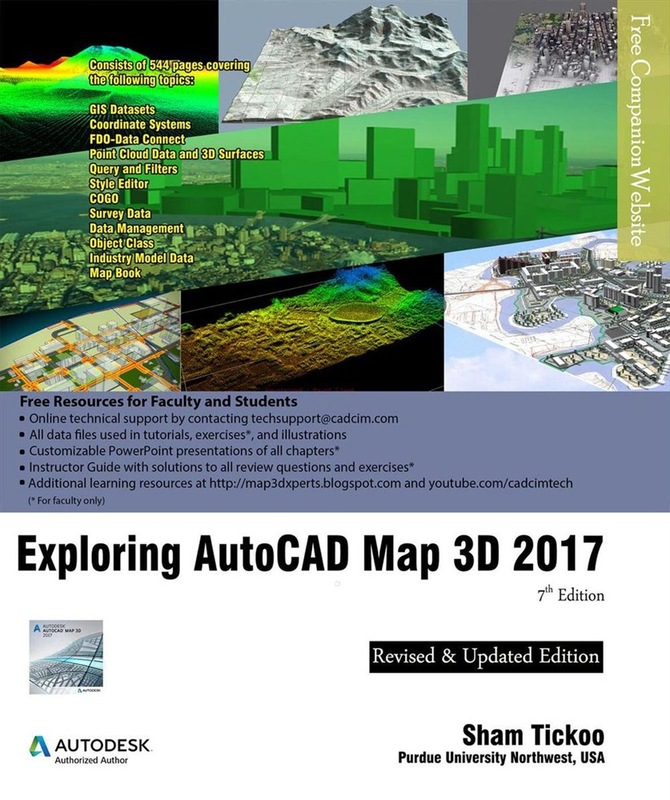 Exploring AutoCAD Map 3D 2017 textbook introduces the users to AutoCAD Map 3D 2017 software. This textbook is a gateway to power, skill, and competence in the field of GIS and spatial analysis. This textbook is specially meant for professionals and students of GIS, Urban Planning, Civil Engineering, Cartography, and CAD professionals who are associated with planning, designing, and data management. Special emphasis has been laid to explain new concepts, procedures, and methods in GIS by using sufficient text and graphical examples. The accompanying tutorials and exercises, which relate to the real world projects, help you understand the usage and abilities of the tools available in AutoCAD Map 3D. The author has emphasized on the tools, options, functions, and interoperability of AutoCAD Map 3D that allow the users to create, analyze, and save complex geospatial data easily and effectively. Furthermore, the chapters in this textbook are arranged in pedagogical sequence that makes it very effective in learning the features and capabilities of the software. A real world project is given for the students to reinforce the concepts learned in the chapters. Acquista Exploring AutoCAD Map 3D 2017, 7th Edition in Epub: dopo aver letto l’ebook Exploring AutoCAD Map 3D 2017, 7th Edition di Prof Sham Tickoo ti invitiamo a lasciarci una Recensione qui sotto: sarà utile agli utenti che non abbiano ancora letto questo libro e che vogliano avere delle opinioni altrui. L’opinione su di un libro è molto soggettiva e per questo leggere eventuali recensioni negative non ci dovrà frenare dall’acquisto, anzi dovrà spingerci ad acquistare il libro in fretta per poter dire la nostra ed eventualmente smentire quanto commentato da altri, contribuendo ad arricchire più possibile i commenti e dare sempre più spunti di confronto al pubblico online.